NOV. 17, 2011 | The asters and goldenrods impressed us with drought-resistant color when 10 members of the Arkansas Native Plant Society joined Martha Bowden and me on October 29 along the Emerald Park Trail above the Arkansas River. 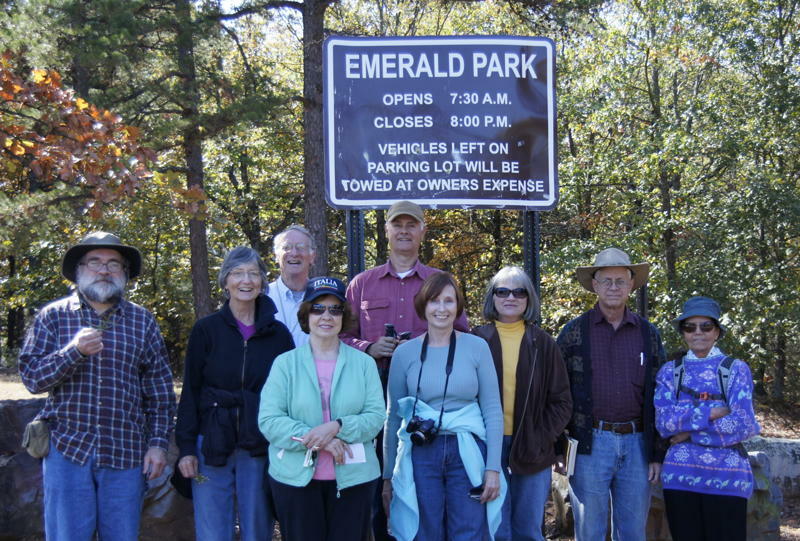 Emerald Park is situated in North Little Rock, along the cliffs on the north shore of the Arkansas River next to the main campus of Pulaski Technical College. The thin soil supports Arkansas’ conventional upland woods of pine, oak, and hickory. Aaahh, but the mockernut hickories were in full color, bright yellow, with leaflets the size of salad plates. And the shortleaf pines, the post and white oaks, blackjack, black, and southern red oaks, the black hickories (and a single shagbark with great, peeling bark plates), the scattered white ash, persimmons, winged elms, black gums, black cherries, serviceberries, possum haws and parsley haws all had their own opinions about just what the proper color should be for late October. On an exposed ledge, with a view of Little Rock and the Coastal Plain behind it, one parsley haw stood loaded with bright orange fruit. The red buckeyes had dropped their leaves weeks ago, but held onto their leathery fruits bulging with gigantic seeds. An unexpected elm in the woods and on the cliffs was cedar elm, which seems to like a sweeter soil than the more common American and winged elms. Cedar elm bears the smallest leaves of any of our native elms; the upper leaf surface is sandpaper-rough; and the leaf tips are blunt or rounded. Like winged elm, the twigs can have corky wings. I have never noticed the species so high and dry. Across the river in Burns Park and along White Oak Bayou in Maumelle—both wet sites—cedar elm associates with nutmeg hickory and bur oak, two other species that are rather fastidious about their soil. The woods were sprinkled with a variety of asters and goldenrods: Aster (Symphyotrichum) patens, A. turbinellis, and A. anomalous; Solidago petiolaris, S. ulmifolia, S. nemoralis, and Euthamia leptocephala. My determinations come like the shirts and pants at the thrift store: as is. Asters and goldenrods are two of the largest and most difficult groups of the large and difficult sunflower family—the species are tough to identify and tough even to tell apart. Nevertheless, they added much-needed ground color to the dry woods. Apparently, like weeds, they don’t need any water. To see them in full flower, dressed to the nines in their purples and yellows after such a long, hot summer, was impressive. I was reminded of a line by Mary Austin, in The Land of Little Rain, about the ephemerals of the Colorado Desert: “The desert floras shame us with their cheerful adaptations to the seasonal limitations” (Houghton, Mifflin and Co., 1903, reissued by Sunstone Press, 2007). Emerald Park would certainly be a good place to botanize in the spring. Aster, late purple (Symphyotrichum patens) (formerly Aster patens)—With two-lobed leaves clasping the stem. Elm, winged (Ulmus alata)—With a pointed leaf that is smooth on top. Oak, black (Quercus velutina)—With orange-yellow inner bark; formerly Quercus tinctoria or yellow oak. Skullcap (Scutellaria)—Only the seed stem was evident. Sunflower, woodland (Helianthus hirsutus)—Also known as bristly or rough-leaved sunflower; one of two woodland sunflowers. Supplejack, Alabama (Berchemia scandens)—Also known as rattan vine. Editor’s Note: A map of the area of the Emerald Park Trail is available here. American Trails noted in 2008 that portions of the trail are very demanding with up and down hills over natural surfaces and hikers should be in very good physical condition. 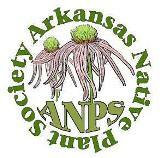 This entry was posted in Field Trips and tagged Arkansas Native Plant Society, Emerald Park, Eric Sundell. Bookmark the permalink.